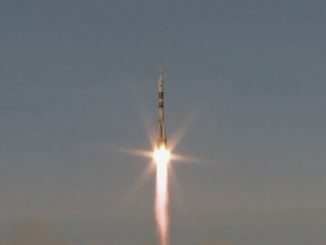 Russian commander Alexey Ovchinin, NASA co-pilot Nick Hague and astronaut Christina Koch lifted off aboard a Soyuz rocket Thursday from the Baikonur Cosmodrome in Kazakhstan, heading for the International Space Station to raise the research outpost’s crew complement back to six. 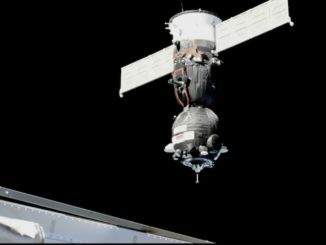 The Soyuz booster launched at 1914 GMT (3:14 p.m. EDT), and docking at the space station occurred at 0101 GMT (9:01 p.m. EDT). 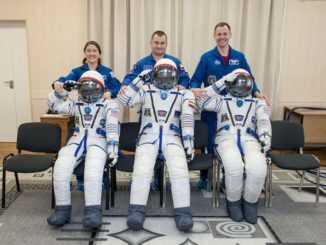 Five months after a frightening launch abort, cosmonaut Alexey Ovchinin and NASA flight engineer Tyler “Nick” Hague, along with first time flier Christina Koch, are set for liftoff Thursday on a six-hour flight to the International Space Station, boosting the lab’s crew back to six. 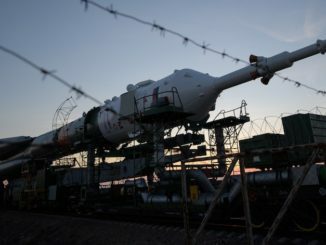 A Soyuz rocket arrived at a historic launch pad in Kazakhstan on Tuesday, where ground crews lifted the booster vertical to begin final preparations for liftoff Thursday with two Americans and one Russian heading for the International Space Station. A Soyuz FG rocket thundered to life and shot into orbit smoothly Monday carrying three crew members on a six-hour flight to the International Space Station. The problem-free ascent came less than two months after an Oct. 11 launch abort that forced a different crew to carry out safe-but-scary emergency landing. 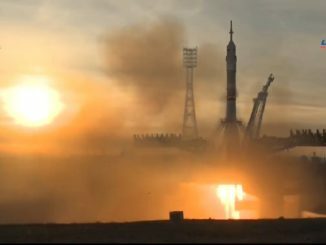 These video replays show the liftoff of the Soyuz rocket carrying Oleg Kononenko, David Saint-Jacques and Anne McClain away from the Baikonur Cosmodrome in Kazakhstan, toward a rendezvous with the International Space Station around six hours later. A Russian Soyuz booster climbed into orbit Monday with a U.S. Army colonel, a veteran Russian cosmonaut and a Canadian flight engineer, kicking off a six-hour chase of the International Space Station. 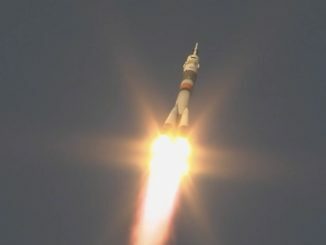 Veteran Russian cosmonaut Oleg Kononenko, flanked by Canadian flight engineer David Saint-Jacques and NASA astronaut Anne McClain, launched toward the International Space Station at 6:31 a.m. EST (1131 GMT) Monday from the Baikonur Cosmodrome in Kazakhstan, the first crew launch for Russia’s space program since a Soyuz booster failure led to the emergency landing of a two-man crew in October. 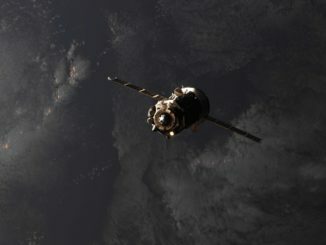 The Soyuz MS-11 spacecraft docked with the station at 12:33 p.m. EST (1733 GMT). 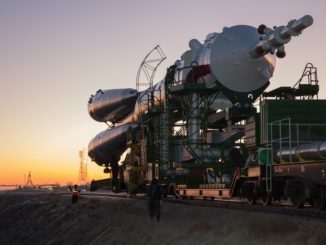 Keeping up a tradition dating back to the dawn of the Space Age, a Russian Soyuz rocket emerged from a hangar at the Baikonur Cosmodrome in Kazakhstan before sunrise Saturday for rollout to Launch Pad No. 1 at the Central Asia space base, moving into position for liftoff Monday with a U.S.-Russian-Canadian crew heading for the International Space Station. 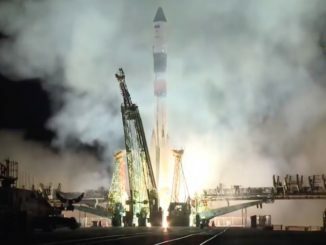 A Russian Progress freighter loaded with nearly three tons of supplies, water and fuel lifted off on top of a Soyuz rocket Friday from the Baikonur Cosmodrome in Kazakhstan on a two-day trek to the International Space Station, clearing the way for the next Soyuz launch Dec. 3 with the next station-bound crew.